See how one of our fountains can change your patio or backyard.  Call or stop at our new showroom. 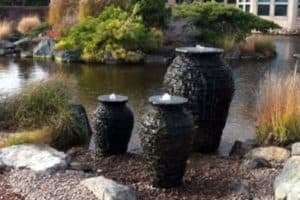 Fountainscapes—large bubbling urns, clusters of basalt column fountains, staggered levels of stone pots pouring into each other, stand-alone fountains, tabletop fountains, even spitting frog fountains—add beauty to your home and bring a sense of calm and relaxation. 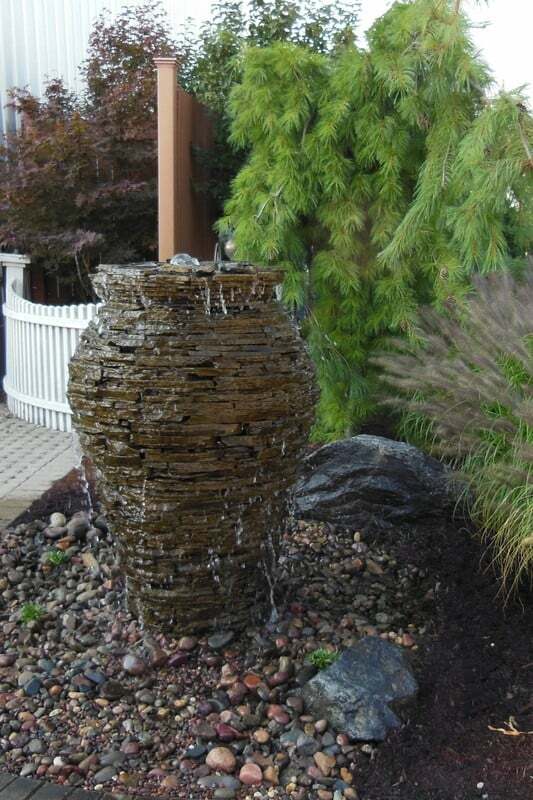 From a simple urn to multiple fountains surrounded by beautiful plants and landscaping, the possibilities are endless. Fountains and fountainscapes utilize an in-ground basin that pumps water up through the fountain that then overflows the fountain container, cascading back into the reservoir to be pumped back through the fountain. There is no mess, no excessive water usage and no hassle. 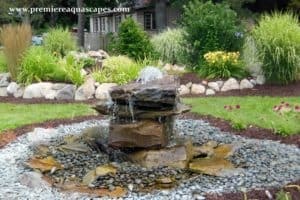 Just call the experts at Premiere Aquascapes, located centrally in the midst of South Bend and Fort Wayne, Indiana, and Kalamazoo and Michigan City, Michigan, and let them provide you with the expert design and skill to build a fountainscape unique to the beauty of your home. Then, you can step out of your busy day, settle into your comfortable chair in your favorite spot and enjoy the relaxing sight and sound of flowing water. 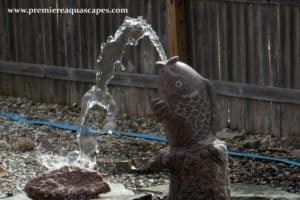 Whether it’s your back deck, a private garden or overlooking the front walkway, the beauty of a waterscape fountain will enhance the time you spend there.